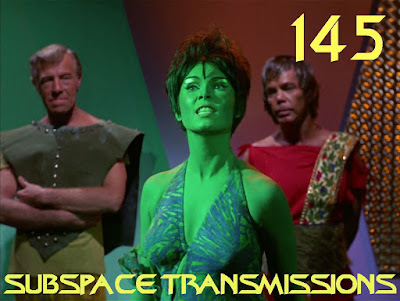 Now that the evolution of both the Andorians and Tellarites has been exhaustively charted, it's time to wrap up the ongoing examination of classic recurring TOS aliens! Thus, hosts Cam Smith and Tyler Orton are channeling their inner-Kermit this week in order to determine if it truly isn't easy being an Orion or Gorn, and whether the franchise loves these iconic species as much as fans. Do they have the depth to support further development in Star Trek Discovery and beyond? And what could the future hold for them? Plus, as an added bonus, the duo toss in a third very cool (non-green) alien just for kicks. Wanna appear on the show? Shoot us a 30 to 60-second audio clip telling us your thoughts on THE ORIONS AND GORN and you could take the spotlight in an upcoming program! You can also send any other questions, topic ideas or feedback to subspacetransmissionspod@gmail.com! Join us next week as we, uh, list some of our favrite favorite awkward Trek moments!